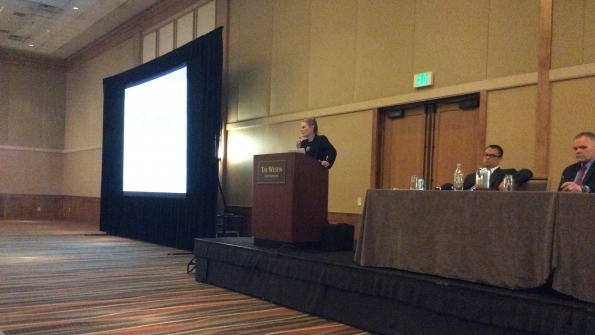 New FirstNet Chairwoman Sue Swenson details the organization's new efforts to reach out to vendors and emphasizes that "this is public safety's network" during remarks delivered during the keynote address at the PSCR stakeholder meeting. WESTMINSTER, COLO.—New FirstNet Chairwoman Sue Swenson yesterday apologized to the vendor community for sending it “mixed messages” in the past and vowed that the organization will improve relationships with the companies that will provide the solutions needed to make a nationwide broadband network for first responders a reality. Since FirstNet was established two years ago, public-safety and LTE vendors have expressed frustrations regarding the lack of meaningful communications with the new entity. FirstNet does have to follow federal guidelines and procedures governing acquisitions and procurement, but the organization definitely wants input from vendors, Swenson said during the opening keynote speech at the annual Public Safety Broadband Stakeholder Meeting hosted by the Public Safety Communications Research (PSCR) program. “We haven’t been clear how interested parties can engage us,” Swenson said “I can’t tell you how many calls I’ve had from vendors—and I don’t mean small vendors, I mean big vendors—saying, ‘I’m really confused. I’ve talked to several people at FirstNet, and they’re saying, ‘We can’t talk to you,’ and I said, ‘That’s not right.’ Now, it’s probably true how [vendors] talk to us is important, but whether they can talk to us is not the issue. To help improve the situation, FirstNet has established a new “Doing Business with FirstNet” portal on its website that is designed to help ensure that all vendor inquiries are addressed. The new site was highlighted by Deputy General Manager TJ Kennedy during a presentation given at one of Monday’s FirstNet committee meetings. Swenson delivered her remarks about an hour after the FirstNet board completed its first meeting in front of a live audience (previously, meetings have been open to the public via webcasts only), a practice that will be continued in the future.